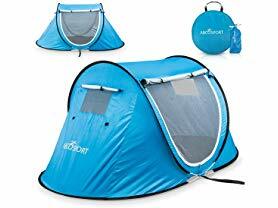 Effortless Camping: Pops open into a read-to-use form (auto-setup) in a blink &amp; proves easy to fold into a compact form – Abco Pop up tent is ideal for casual camping and accommodates 1-2 persons. Like a beautiful spot enroute? Setup your tent instantly!